U-boat is an anglicised version of the German word U-Boot [ˈuːboːt] ( listen ), a shortening of Unterseeboot, literally "underseaboat." While the German term refers to any submarine, the English one (in common with several other languages) refers specifically to military submarines operated by Germany, particularly in the First and Second World Wars. Although at times they were efficient fleet weapons against enemy naval warships, they were most effectively used in an economic warfare role (commerce raiding) and enforcing a naval blockade against enemy shipping. The primary targets of the U-boat campaigns in both wars were the merchant convoys bringing supplies from Canada and other parts of the British Empire, and from the United States to the United Kingdom and (during the Second World War) to the Soviet Union and the Allied territories in the Mediterranean. German submarines also destroyed Brazilian merchant ships during World War II, causing Brazil to declare war on the Axis powers in 1944. 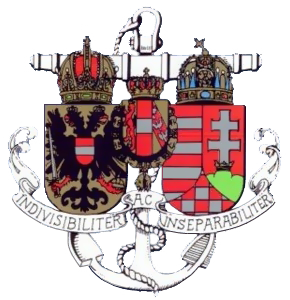 The Austro-Hungarian Navy or Imperial and Royal War Navy was the naval force of Austria-Hungary. Ships of the k.u.k. Kriegsmarine were designated SMS, for Seiner Majestät Schiff. Existing between 1867 and 1918, the k.u.k. Kriegsmarine came into being after the formation of Austria-Hungary in 1867, and ceased to exist upon the Empire's defeat and subsequent collapse at the end of World War I. The first submarine built in Germany, the three-man Brandtaucher , sank to the bottom of Kiel harbor on 1 February 1851 during a test dive. The inventor and engineer Wilhelm Bauer had designed this vessel in 1850, and Schweffel & Howaldt constructed it in Kiel. Dredging operations in 1887 rediscovered Brandtaucher; it was later raised and put on historical display in Germany. Brandtaucher was a submersible designed by the Bavarian inventor and engineer Wilhelm Bauer and built by Schweffel & Howaldt in Kiel for Schleswig-Holstein's Flotilla in 1850. Friedrich Krupp Germaniawerft was a German shipbuilding company, located in the harbour at Kiel, and one of the largest and most important builders of U-boats for the Kaiserliche Marine in World War I and the Kriegsmarine in World War II. The original company was founded in 1867 but went bankrupt and was bought out by Friedrich Krupp. Krupp was very interested in building warships and in the time before the First World War built a number of battleships for the Kaiserliche Marine, including SMS Posen, SMS Prinzregent Luitpold, SMS Kronprinz, and SMS Sachsen. A total of 84 U-boats were built in the shipyard during the war. After the war it returned to the normal production of yachts and transports. Forel was a midget submarine designed by Raimondo Lorenzo D’Equevilley-Montjustin and built by Krupp in Kiel, Germany. The design was an experimental design built as a private venture by Krupp in hopes of attracting a contract from the Imperial German Navy. Although the design proved moderately successful, the submarine did not attract German naval attention. She was purchased by the Imperial Russian Navy in 1904 and served with the IRN until she was lost in a diving accident in 1910. She had the distinction of being the first submarine to have been built in Germany, preceding SM U-1. Forel was succeeded in service by the Krab class. HMS Pathfinder was the lead ship of the Pathfinder class of scout cruisers, and was the first ship ever to be sunk by a locomotive torpedo fired by submarine. She was built by Cammell Laird, Birkenhead, launched on 16 July 1904, and commissioned on 18 July 1905. She was originally to have been named HMS Fastnet, but was renamed prior to construction. SM U-21 was a U-boat built for the Imperial German Navy shortly before World War I. The third of four Type U-19-class submarines, these were the first U-boats in German service to be equipped with diesel engines. U-21 was built between 1910 and October 1913 at the Kaiserliche Werft in Danzig. She was armed with four torpedo tubes and a single deck gun; a second gun was added during her career. The Action of 22 September 1914 was a German U-boat ambush that took place during the First World War, in which three obsolete Royal Navy cruisers, manned mainly by reservists and sometimes referred to as the livebait squadron, were sunk by a German submarine while on patrol. The Gallipoli Campaign, also known as the Dardanelles Campaign, the Battle of Gallipoli or the Battle of Çanakkale, was a campaign of the First World War that took place on the Gallipoli peninsula. The Entente powers, Britain and France, sought to weaken the Ottoman Empire by taking control of the straits that provided a supply route to Russia, the third member of the Entente. The invaders launched a naval attack followed by an amphibious landing on the peninsula, to capture the Ottoman capital of Istanbul. The naval attack was repelled and after eight months' fighting, with many casualties on both sides, the land campaign was abandoned and the invasion force was withdrawn. It was a costly and humiliating defeat for the Allies and for the sponsors, especially Winston Churchill. For the first few months of the war, U-boat anticommerce actions observed the "prize rules" of the time, which governed the treatment of enemy civilian ships and their occupants. On 20 October 1914, SM U-17 sank the first merchant ship, the SS Glitra, off Norway. Surface commerce raiders were proving to be ineffective, and on 4 February 1915, the Kaiser assented to the declaration of a war zone in the waters around the British Isles. This was cited as a retaliation for British minefields and shipping blockades. Under the instructions given to U-boat captains, they could sink merchant ships, even potentially neutral ones, without warning. In February 1915, a submarine U-6 (Lepsius) was rammed and both periscopes were destroyed off Beachy Head by the collier SS Thordis commanded by Captain John Bell RNR after firing a torpedo. On 7 May 1915, SM U-20 sank the liner RMS Lusitania. The sinking claimed 1,198 lives, 128 of them American civilians, and the attack of this unarmed civilian ship deeply shocked the Allies. According to the ship's manifest, Lusitania was carrying military cargo, though none of this information was relayed to the citizens of Britain and the United States who thought that the ship contained no ammunition or military weaponry whatsoever and it was an act of brutal murder. Munitions that it carried were thousands of crates full of ammunition for rifles, 3-inch artillery shells, and also various other standard ammunition used by infantry. The sinking of the Lusitania was widely used as propaganda against the German Empire and caused greater support for the war effort. A widespread reaction in the U.S was not seen until the sinking of the ferry SS Sussex. The sinking occurred in 1915 and the United States entered the war in 1917. Of the 373 German submarines that had been built, 178 were lost by enemy action. Of these 41 were sunk by mines, 30 by depth charges and 13 by Q-ships. 515 officers and 4894 enlisted men were killed. They sank 10 battleships, 18 cruisers and several smaller naval vessels. They further destroyed 5,708 merchant and fishing vessels for a total of 11,108,865 tons and the loss of about 15,000 sailors. The Pour le Mérite, the highest decoration for gallantry for officers, was awarded to 29 U-boat commanders. 12 U-boat crewmen were decorated with the Goldene Militär-Verdienst-Kreuz, the highest bravery award for non-commissioned officers and enlisted men. The most successful U-boat commanders of World War I were Lothar von Arnauld de la Perière (189 merchant vessels and two gunboats with 446,708 tons), followed by Walter Forstmann (149 ships with 391,607 tons), and Max Valentiner (144 ships with 299,482 tons). Their records have never been surpassed by anyone in any later conflict so far. During World War II, U-boat warfare was the major component of the Battle of the Atlantic, which began in 1939 and ended with Germany's surrender in 1945. 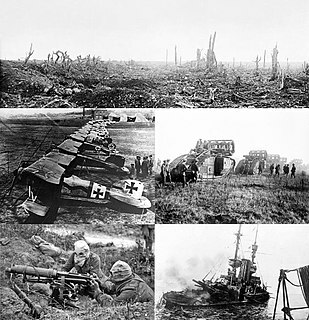 The Armistice of November 11th, 1918 ending World War I had scuttled most of the old Imperial German Navy and the subsequent Treaty of Versailles of 1919 limited the surface navy of Germany's new Weimar Republic to only six battleships (of less than 10,000 tons each), six cruisers, and 12 destroyers. To compensate, Germany's new navy, the Kriegsmarine, developed the largest submarine fleet going into World War II. British Prime Minister Winston Churchill later wrote "The only thing that really frightened me during the war was the U-boat peril." The U-boats' main weapon was the torpedo, though mines and deck guns (while surfaced) were also used. By the end of the war, almost 3,000 Allied ships (175 warships; 2,825 merchant ships) were sunk by U-boat torpedoes. Early German World War II torpedoes were straight runners, as opposed to the homing and pattern-running torpedoes that were fielded later in the war. They were fitted with one of two types of pistol triggers: impact, which detonated the warhead upon contact with a solid object, and magnetic, which detonated upon sensing a change in the magnetic field within a few meters. Several other pioneering innovations included acoustic- and electro-absorbent coatings to make them less of an ASDIC or RADAR target. The Germans also developed active countermeasures such as facilities to release artificial chemical bubble-making decoys, known as Bold , after the mythical kobold. The German submarine U-110, a Type IXB, was captured in 1941 by the Royal Navy, and its Enigma machine and documents were removed. U-559 was also captured by the British in October 1942; three sailors boarded her as she was sinking, and desperately threw all the code books out of the submarine so as to salvage them. Two of them, Able Seaman Colin Grazier and Lieutenant Francis Anthony Blair Fasson, continued to throw code books out of the ship as it went under water, and went down with it. Further code books were captured by raids on weather ships. U-744 was boarded by crew from the Canadian ship HMCS Chilliwack on 6 March 1944, and codes were taken from her, but by this time in the war, most of the information was known. The U-505, a Type IXC, was captured by the United States Navy in June 1944. It is now a museum ship in Chicago at the Museum of Science and Industry. Germany has brought the U-boat name into the 21st century with the new Type 212. The 212 features an air-independent propulsion system using hydrogen fuel cells. This system is safer than previous closed-cycle diesel engines and steam turbines, cheaper than a nuclear reactor and quieter than either. While the Type 212 is also being purchased by Italy  and Norway  , the Type 214 has been designed as the follow-on export model and has been sold to Greece, South Korea and Turkey. German submarine U-552 was a Type VIIC U-boat built for Nazi Germany's Kriegsmarine for service during World War II. She was laid down on 1 December 1939 at Blohm & Voss in Hamburg as yard number 528, launched on 14 September 1940 and went into service on 4 December 1940. U-552 was nicknamed the Roter Teufel after its mascot of a grinning devil which was painted on the conning tower. She was one of the more successful of her class, operating for over three years of continual service and sinking or damaging 30 Allied ships with 164,276 tons sunk and 26,910 tons damaged. She was a member of 21 wolf packs. German submarine U-238 was a Type VIIC U-boat of Nazi Germany's Kriegsmarine built for service in the Second World War. She was laid down on 21 April 1942, by Germaniawerft of Kiel as yard number 668, launched on 7 January 1943 and commissioned on 20 February, with Oberleutnant zur See Horst Hepp in command. Hepp commanded her for her entire career, receiving promotion to Kapitänleutnant in the process. "The shipping of the enemy powers is one great whole. It is therefore in this connection immaterial where a ship is sunk—it must still in the final analysis be replaced by a new ship". German submarine U-75 was a Type VIIB U-boat of Nazi Germany's Kriegsmarine during World War II. U-75 was moderately successful in her early career in the Battle of the Atlantic, but in autumn 1941 she was dispatched to the Mediterranean Sea with poor results, leading to the eventual destruction of the boat and her crew. German submarine U-961 was a Type VIIC U-boat built for Nazi Germany's Kriegsmarine during World War II. U-961 was constructed at Hamburg during 1942 and 1943, completing her working-up cruises in the Baltic Sea in the spring of 1944. Due to extensive modifications and shortages of supplies during her construction and training, U-961 took nearly two years to be ready for active service, an exceptionally long time. Deutschland was a blockade-breaking German merchant submarine used during World War I. It was developed with private funds and operated by the North German Lloyd Line. She was the first of seven U-151-class U-boats built and one of only two used as unarmed cargo submarines. SM U-70 was a Type U 66 submarine or U-boat for the German Imperial Navy during the First World War. She had been laid down in February 1914 as U-11 the final boat of the U-7 class for the Austro-Hungarian Navy but was sold to Germany, along with the others in her class, in November 1914. The U-boat Campaign from 1914 to 1918 was the World War I naval campaign fought by German U-boats against the trade routes of the Allies. It took place largely in the seas around the British Isles and in the Mediterranean. The German Empire relied on imports for food and domestic food production and the United Kingdom relied heavily on imports to feed its population, and both required raw materials to supply their war industry; the powers aimed, therefore, to blockade one another. The British had the Royal Navy which was superior in numbers and could operate on most of the world's oceans because of the British Empire, whereas the Imperial German Navy surface fleet was mainly restricted to the German Bight, and used commerce raiders and unrestricted submarine warfare to operate elsewhere. ↑ Compare: Chaffin, Tom (2010). The H. L. Hunley: The Secret Hope of the Confederacy. Macmillan. p. 53. ISBN 9781429990356 . Retrieved 14 July 2016. Bauer's boat made a promising start, diving in tests in the Baltic Sea's Bay of Kiel to depths of more than fifty feet. In 1855, during one of those tests, the boat malfunctioned. The Brandtaucher plunged fifty-four vertical feet and refused to ascend from the seafloor. Bauer and his crew – leaving their craft on the bottom – barely escaped with their lives. ↑ "WWI U-Boats U-17". Uboat.net. Retrieved 24 March 2008. ↑ Haley Dixon (21 June 2013). "Story of Captain's courage resurfaces after 98 years". Daily Telegraph. Retrieved 22 June 2013. ↑ "Full text of "A North Sea diary, 1914–1918 / Commander Stephen King-Hall"". ↑ Hakim, Joy (1998). A History of Us: War, Peace and all that Jazz. New York: Oxford University Press. pp. 100–104. ISBN 0-19-509514-6. ↑ "Military History Online". www.militaryhistoryonline.com. Retrieved 4 February 2019. ↑ Karl Dönitz. Memoirs: Ten Years and Twenty Days. Naval Institute Press. p. 482. ISBN 0-87021-780-1. ↑ Stern, Robert Cecil (1991). Type VII U-boats (First U.S. & Canada ed.). Annapolis, Maryland 21402: Naval Institute Press. p. 155. ISBN 1-55750-828-3 . Retrieved 1 January 2019. ↑ "Naval Technology on the Todaro class" . Retrieved 9 March 2019. ↑ Berg Bentzrød, Sveinung (3 February 2017). "Forsvaret kjøper nye ubåter fra Tyskland" [The Armed Forces are purchasing new submarines from Germany]. Aftenposten (in Norwegian). Oslo: Aftenposten AS. Retrieved 9 March 2019. Wikimedia Commons has media related to U-boat .